Inside contemporary Chinese restaurant, Tattu, which opens Feb 1. Déjà vu — it's not the sense we usually get when walking into a restaurant that's bringing a completely new concept to the city. But we've been here before. Tattu's two floors of exquisite modern Chinese dining cleverly fills the space where The Grand's Boiler Room used to live. It's been almost four years since, taking a tour of the shell of a building, we were told that "the unit" would become a restaurant and bar, but only for the right tenant. After an hour with Tattu's co-owner, Adam Jones, we can see why The Grand waited for this thoughtful, ambitious, brother-brother team. Even if they are from Manchester. Only the third venue in what already feels like a seriously established brand, Brum is Tattu's biggest and most ambitious opening. "This is the first heritage building we've brought the concept to, and it's definitely been the most complex", says Adam. You'll see obvious stylistic similarities to the Leeds and Manchester restaurants but each city applies the house style to a different theme. "Yin and yang — which in Chinese philosophy is a way of describing how seemingly opposing forces actually complement each other — made so much sense when it came to this fit-out," explains Adam. "We're putting modern Chinese food and a hugely contemporary interior into one of Birmingham's most iconic and historic buildings, and it works". This is a statement not a question, and Adam's confidence is utterly justified. A chef hands Adam a five-spiced lamb, to sample — version one of a dish that may or may not make the Birmingham menu. Though the offering is similar across Tattu's three restaurants, every team member is encouraged to come up with new ideas and twists on dishes, and honey glazed baby chicken (£16.50) will be available exclusively in Brum. 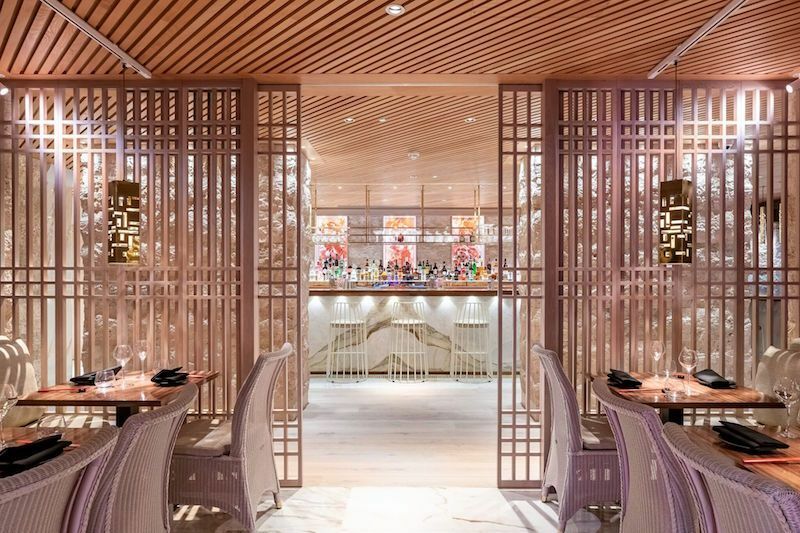 The fit-out includes Tattu's first open plan kitchen, where you'll find two dim sum masters and seven wok chefs, if you can take your eyes off your food, your drink and the interiors long enough. Adam is one of very few owners to give straight answers to his absolute picks on food and drink. 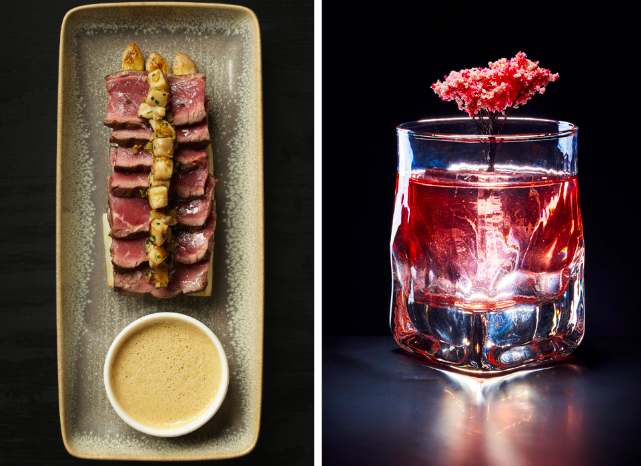 "The beef fillet with caramel soy (£30) is so good — other restaurants have had a go at it but we're not giving away the secret to that sauce to anyone. Including you." In terms of the upstairs bar (pictured top), it's got to be the cherry blossom Negroni (£10) for Adam, which uses actual blossom for decoration and cherry blossom vermouth for flavour. 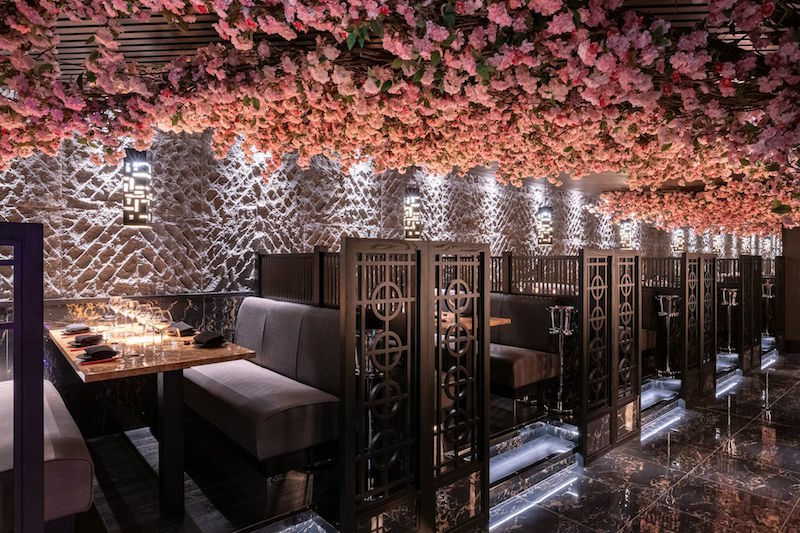 Despite making room for 130 covers, the atmospheric, dark ground floor "yin" space is divided into four different dining areas, with room for intimate tables for two, as well as plenty of spots with a view of the kitchen in the largest area. Five Japanese cherry blossom trees — the most you'll find at any Tattu — unite the floor. 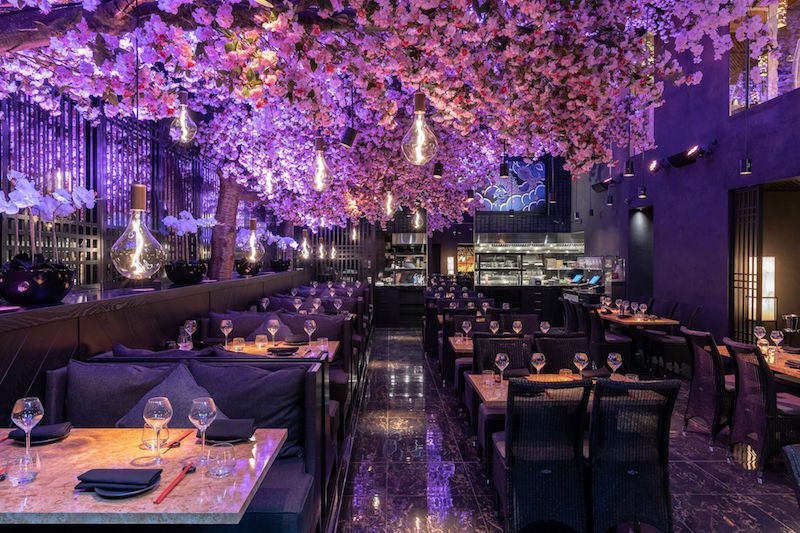 "It takes six months for our supplier to finish a tree: sourcing it, then creating the blooms by hand to the exact specification of the space, before disassembling the tree and putting it back together in the restaurant," says Adam. The team light the trees with the seasons and hang lanterns from them for Chinese New Year — the very best looking time of the year for the restaurant according to Adam, and falling shortly after the team's official opening on February 1. You're looking at one of our two fave spots in the restaurant. The orchid-clad table for four was originally going to be a waiter's station but the space turned out to be a little bigger than originally expected, and this booth, complete with sound-control and hand-drawn body art was the result. 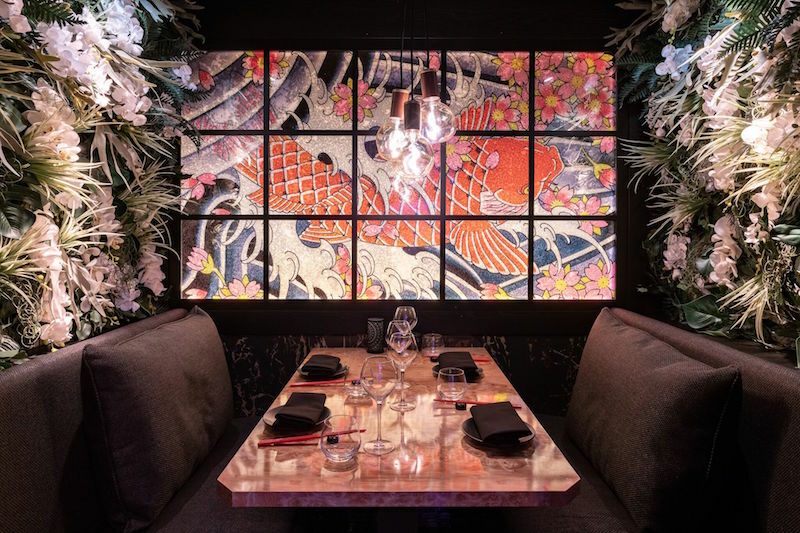 The bright, light, "yang" upstairs (pictured top) is the first time Tattu's colour palette has veered from moody and it includes our second favourite spot, a semi-private dining room with sliding doors, that overlooks the main restaurant. Like the rest of the top floor, the space uses the same designs as the yin theme downstairs, but with different lighter-coloured finishes, from the chairs to the walls, to the ever so covetable pendant light fittings. It's almost like Adam planned every inch of this place.